The boatyard area of the Port of Cannes is located on the Quai Laubeuf. Closed from mid-August to mid-October. 37 boats, with 21 places for boats over 10m. Maximum : 28m long, 6.30m wide 100 tonnes. An experienced team is available, for extended hours in season. The Port of Cannes provides a public boatyard area, with the equipment and skills to assist you to carry out work on your boat. 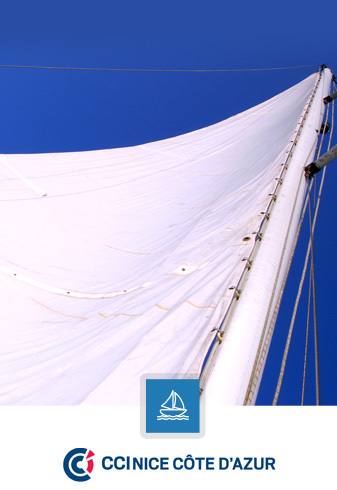 You are completely free to choose which service providers to use for your boat repairs and maintenance. The French Riviera Chamber of Commerce is not responsible for the works or material (ladders, scaffolding), although a list of tradesmen is available from the office reception desk. The Port of Cannes is committed to environmental protection and is ISO 14001 certified. In a port, boat maintenance and other activities in the boatyard area are the main sources of toxic waste. Distress flares are considered to be especially dangerous waste. Under current regulations, flares are valid for 3.5 years. With out-of-date flares, there is a risk of spontaneous firing, if they are not correctly stored. A "Waste Disposal Point" (Point Propre) is available in the boatyard area to allow safe disposal of toxic waste. Le Port of Cannes is committed to respect for the environment and is certified for ISO 14001. As with other port activities, the boatyard area has adopted the strictest rules concerning the environment. Our shipyard is equipped with secure control systems for handling wash-down water, rubbish disposal, protection against hydrocarbon pollution and maximum reduction of dust emissions and noise disturbance. An area has also been created for the disposal of dangerous waste. (Waste disposal point), non-dangerous and household waste.